Each foil pack contains 125 ml of lifesaving purified water for use in emergency and rationed survival situations. These safe and convenient pre-measured 125 ml foil packs are easy to dispense and easy to store. 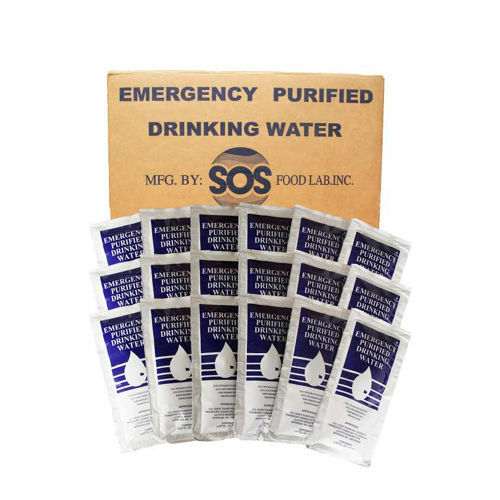 Unlike bottled water which must be rotated and replaced every 6 months, these water packs are manufactured with a 5 year shelf life.SOS emergency water packs can withstand temperatures ranging from -40° F to 230° F. Can be frozen without any adverse effects, and it can also be used as cold compress. US Coast Guard and Transport Canada approved.